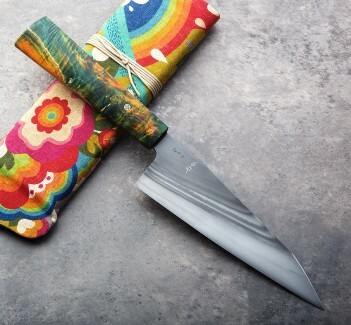 Bryan Raquin does it again with a water-quenched 205mm san mai blade hand-forged from 145sc ('super-clean') small-batch carbon steel with XC10 cladding. 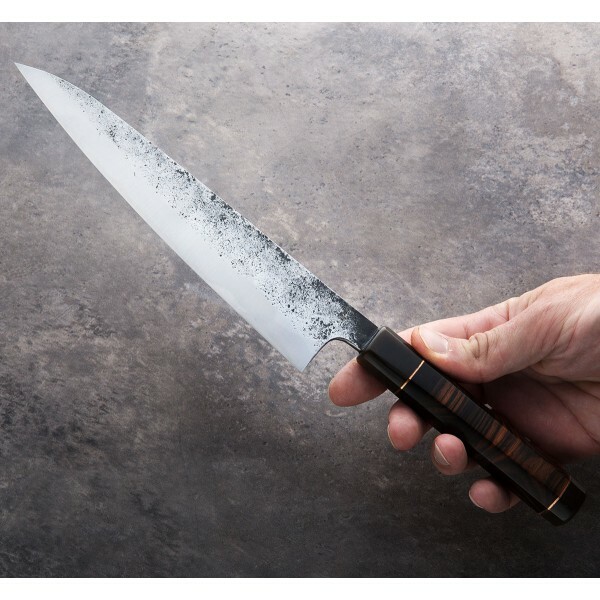 Balanced at the choil and weighing 5.6oz / 160g with a curved, rocking edge and Bryan's typically outstanding convex edge geometry, this is a mid-size chef knife to everyday use that will make any cook want to keep on cutting. 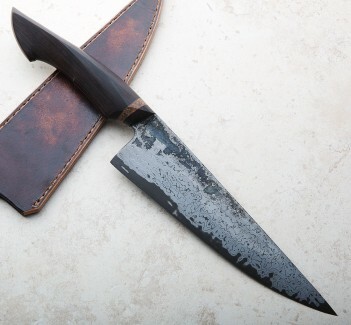 The wa-style handle, by Anton Kudris, has nicely rounded edges all around and thins slightly at the front. The cross-cut Malaysian Blackwood shows incredible grain and is flanked by copper spacers and horn bolsters. A wooden saya is included. 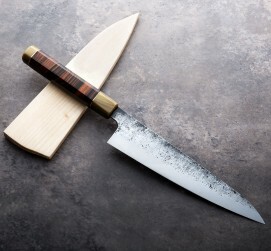 Forging handmade chef knives one at a time at his shop in Central France, Bryan Raquin has quickly gained a reputation for creating classically designed and beautifully executed blades, spending countless hours refining the heat treatment and water-quench of the steels he uses for optimal grain structure and edge performance. 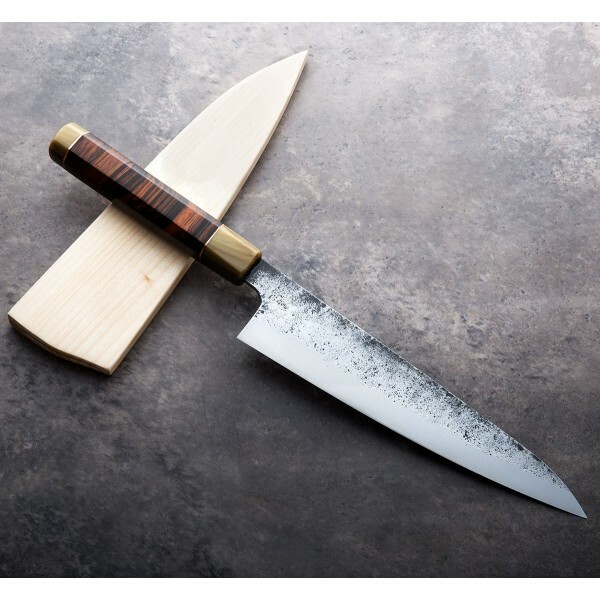 Hard, sharp and fast are a few words we might use to describe his work and this 205mm all-around chef with a wa-style handle is no exception. Blade length: 205mm / 8.07".  Overall length: 13.75". Blade width 1" in front of heel: 2.5mm. Blade width 1" from tip: 1.2mm. Blade height at heel: 44mm. Weight: 5.6oz / 160g. San mai blade: 145sc steel core ("super-clean," containing 1.45% carbon) and XC10 cladding. Handle: Cross-cut Malaysian Blackwood with horn bolsters and copper spacers. Handmade saya included.